Where Have You Gone, Secretariat? Jockey Ron Turcotte hangs on as Secretariat romps along the final stretch before winning the Triple Crown in 1973. Jockey Ron Turcotte walks Secretariat towards the winners circle after they captured the Triple Crown in 1973. In the wake of American Pharoah’s stunning wire-to-wire Triple Crown-clinching victory at the Belmont Stakes on Saturday, I compared him to Secretariat, finding that — despite having one of the finest Triple Crown campaigns ever — American Pharoah still likely would have finished the Belmont well behind his great-great-great-grandfather. Some readers seem to think this was a cheap shot at the slump-busting champion, although you’d think being called second-best to a mutant horse sent from the future would be considered high praise. Secretariat’s 2:24 Belmont time is safe; no other horse has run under 2:26 (even that is about 10 lengths behind Secretariat). Oh, and he still owns the Kentucky Derby and Preakness Stakes records by two to three lengths each. It has been over four decades, and great horses still can’t come close. But what do we make of this? How is it that even the best horse this era has to offer — with a stride so smooth that it borders on poetic — would still finish 13 lengths behind Big Red? Clearly, it’s that Secretariat is overrated. OK, exhale. I’m not trolling you. I’m just being extremely nitty about the marginal shades of “really, really great.” By “overrated,” I certainly don’t mean to imply that Secretariat isn’t the best 3-year-old American racehorse in history — he is. Or that his Belmont run wasn’t one of the most dazzling moments in sports history (I practically sleep with this footage of it under my pillow). I mean simply that one of the key selling points of his unfathomable greatness is slightly undermined by its broader context. Specifically, that his records — did I mention it has been over 40 years? — have lasted so long in part because the quality of thoroughbred racing has plateaued and perhaps even weakened. Again, for purposes of parsing different shades of awesome, note that in 1973, for all the drama, Secretariat’s records were pretty garden-variety awesome. That is, they weren’t really far off from where we’d expect the progression of records to have led. 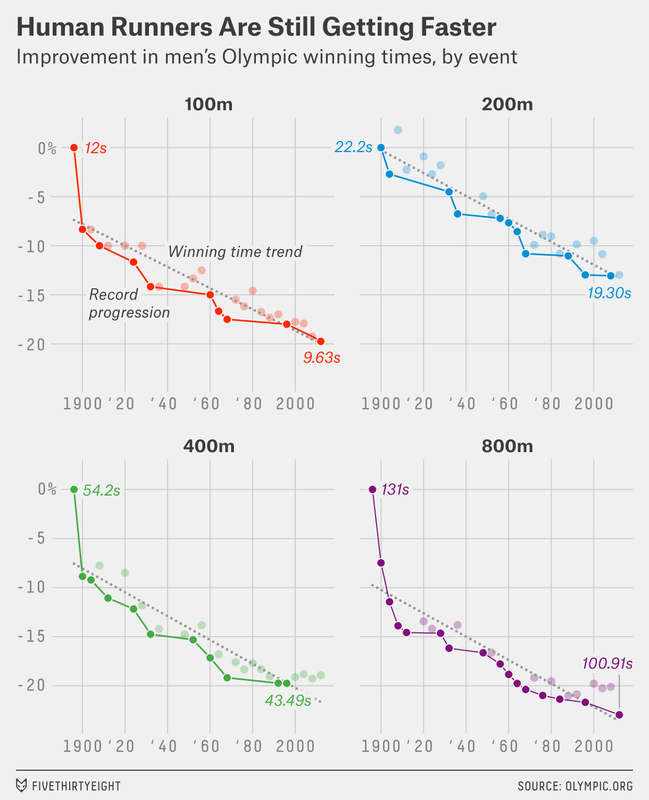 Indeed, the gap between his record times and the linear (pre-plateau) trend for winning times was reasonably narrow. Which is to say, Secretariat was no Bob Beamon. Beamon’s 1968 long jump in Mexico City beat the previous long jump record by 0.55 meters — which still accounts for 41 percent of the improvement seen in that event’s entire recorded history (and Beamon’s record still stood for only 22 years). 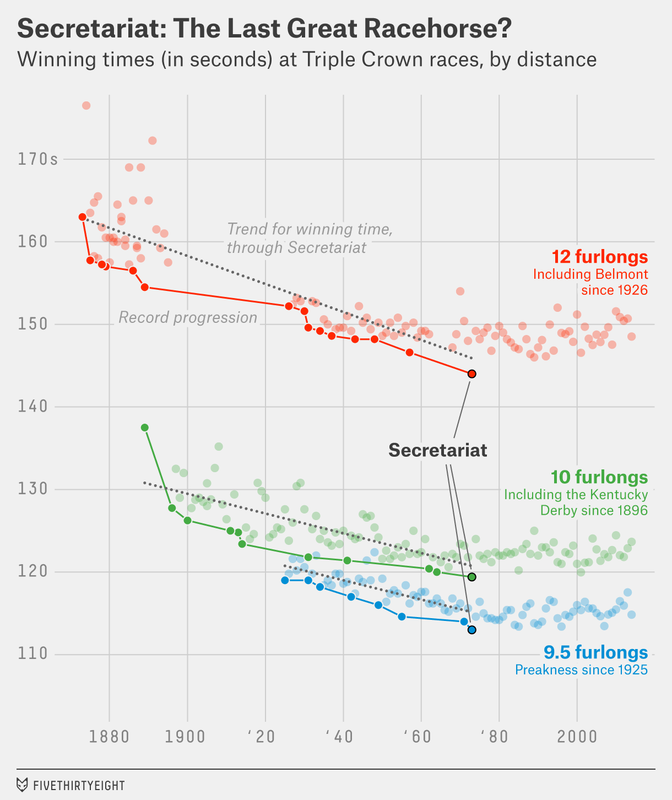 Secretariat’s records have stood for this long not because they were so absurd at the time that we have yet to catch up, but because we stopped catching up. Only Michael Johnson’s 400-meter Olympic record has been around since before the 2008 Beijing Olympics. The single longest standing world record in any IAAF track-and-field event dates back only to 1983. For some athletic disciplines, the constant improvement over time has been so consistent as to be almost creepy. As to why horse racing hasn’t improved the way human racing has, this old FiveThirtyEight article has a good roundup of speculation — including small population size and lack of genetic diversity. The elite genes in the racing gene pool may be drifting overseas, and, in general, thoroughbred racing’s center of gravity may be shifting. All of that serves as a reminder that although we often celebrate horses as athletes, the sport of horse racing isn’t really comparable to human athletics. If it were, a superhorse as super as American Pharoah would be rewriting the record books. These distances have been paired with these races since 1926. Each race changed its distance at various points before that (for example, the Derby was 12 furlongs from 1875 to 1895).